Groundswell Educational Films is excited to announce that for the first time ever, our award-winning documentary “The Return of Navajo Boy” will be available for purchase on Home DVD. The DVD also includes Groundswell’s new 15 minute epilogue which carries the film forward and shows what happened after its release and how activists are using it today to build support for the uranium cleanup movement. Until now, the film had been screening nationwide at universities, conferences and other locations, available only to activists and scholars. But now anybody can take home the Sundance-premiering documentary. 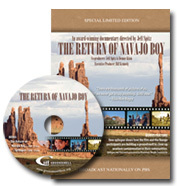 To order the film, visit the official “Return of Navajo Boy” website.